Jump straight into pure action with Natural Born Soldier, an FPS that gives you the unique opportunity to personify a soldier and defend your homeland from your mobile device. Customize your 3D soldier's face with your own picture or avatar! The end result is pretty cool as other players see you transposed into the game itself. Just imagine playing against friends and peoples you know! You will have a unique and amazing experience which no other FPS on the mobile market provides. The goal is to bring into the mobile market a fun FPS that generates strong emotions and is really easy to grasp. 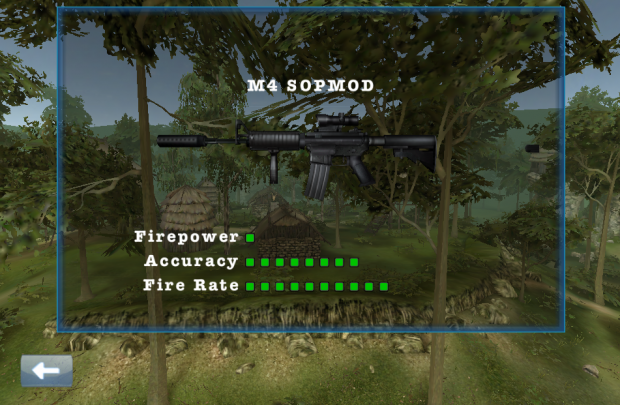 Weapon selection screen showing the weapons the player can unlock by when reaching higher score.